Vancouver, British Columbia--(Newsfile Corp. - February 12, 2019) - Spearmint Resources Inc. (CSE: SPMT) (OTC Pink: SPMTF) (FSE: A2AHL5) (the "Company") is pleased to announce that upon receiving a complete set of airborne data showing the presence of anomalies outside the boundaries of the Company's pre-existing acreage, the Company has strategically increased its Chibougamau Vanadium Prospect by 2,190 acres to a total of 16,175 contiguous acres. The recently received airborne data shows the presence of multiple sharply defined areas of northeast trending magnetic susceptibility, including an anomaly measuring 9km in length, which has now expanded to a total of 12km in length with the acquisition of the new claims (Figure 1). James Nelson, President of Spearmint, stated "We are pleased to have received such encouraging data from the airborne survey recently completed over our Chibougamau Vanadium Prospect. In light of receiving this complete set of data, we immediately and strategically expanded our land package to cover new anomalies identified outside of our pre-existing acreage. The airborne data has identified multiple sharply defined magnetic anomalies, including one anomaly measuring 9km in length which has now grown to 12 km with the new claims acquisition. This newly acquired acreage certainly strengthens our footprint in this world class Vanadium district. A follow up work program is being formulated and management is excited to further investigate these anomalies to determine whether they are vanadium bearing like that of our neighbour BlackRock Metals." 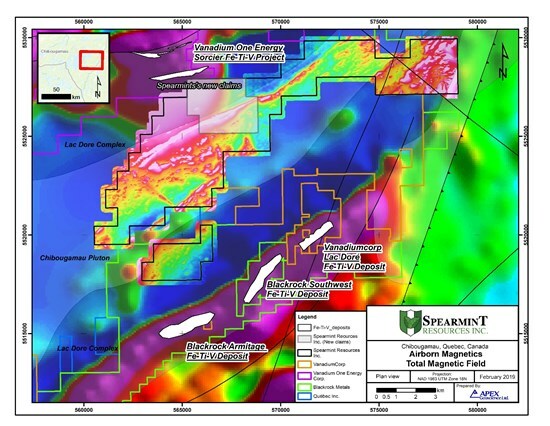 Spearmint's current projects include the 'Chibougamau Vanadium Prospect' comprising of 16,175 contiguous acres bordering the vanadium deposit of BlackRock Metal's (private) Ilmenite vanadium project and Vanadium One Energy Corp. and Spearmint's 'Clayton Valley Lithium Prospects' in Nevada comprising of two claim blocks totaling 800 acres bordering Pure Energy Minerals & Cypress Development Corp.
Spearmint's current projects also include a portfolio of prospects in the Golden Triangle of British Columbia; the 'Golden Triangle Gold Prospects' comprising of six separate claims blocks totalling 9,157 acres bordering GT Gold Corp, the 920 acre 'NEBA West' & 6,803 acre 'NEBA' Gold-Copper Prospects bordering Aben Resources Ltd, the 'Henry' Gold-Copper Prospect consisting of two contiguous claim blocks totalling 1,989 acres in the direct vicinity of Golden Ridge Resources Ltd., and the 21,587 acre 'EL North' Nickel-Copper Prospect is a contiguous land package of six claims in the Eskay Creek Camp bordering Garibaldi Resources Corp. Spearmint's other projects in British Columbia include the 'Gold Mountain Prospects' comprising of three separate claim blocks totalling 1,245 acres bordering Barkerville Gold Mines, the 'Safari' Copper-Gold Prospect consisting of 9,007 contiguous acres located in the northern Quesnel Trough in North-Central BC directly bordering Serengeti Resources Inc., and the 'Hammernose' Gold Prospect consisting of 5,140 acres directly bordering the strategic alliance between Westhaven Ventures Inc. & Sable Resources Ltd. in the Spences Bridge gold belt located in Southern British Columbia, Canada. These new claims were acquired via Gestim. 04/01 SPEARMINT RESOURCES : Acquires the 'El North 3' Claims Package in the Golden Tri..
04/01 Spearmint Acquires the 'El North 3' Claims Package in the Golden Triangle of ..
02/12 SPEARMINT RESOURCES : Immediately and Strategically Expands its Quebec Vanadium ..
02/12 Spearmint Immediately and Strategically Expands its Quebec Vanadium Prospect ..
02/04 VANADIUM ONE ENERGY : Spearmint Identifies Multiple Sharply Defined Magnetic Ano..
02/01 Spearmint Identifies Multiple Sharply Defined Magnetic Anomalies, Including a..
02/01 SPEARMINT RESOURCES : Identifies Multiple Sharply Defined Magnetic Anomalies, In..
2018 SPEARMINT RESOURCES : Significantly Expands its Vanadium Acreage in Quebec After..